Using a 2-inch ring mold, place some Herbed Cream Cheese on a small dish. Top with a layer of Egg Salad. 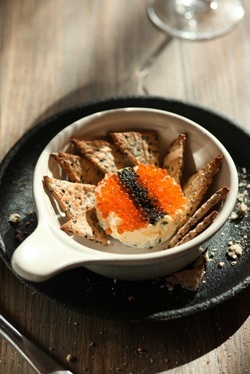 Remove ring mold and arrange caviar and roe on top. Place Benne Wafers around the caviar pie. Preheat oven to 350 degrees. Mix together all dry ingredients. Small dice butter and cut into dry ingredients with a pastry cutter. Add milk and work until dough comes together smoothly. Wrap dough with plastic wrap and rest for half an hour. Roll dough out either by hand or using a pasta machine to 1/8-inch thickness. Cut into triangles and bake for 8 to 12 minutes.